Naas AFC Blue draw with Newbridge United. Sallins Celtic suffer defeat to Newbridge United. Suncroft AFC lose to Newbridge United. 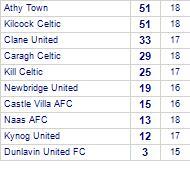 Clane United share points with Newbridge United. Caragh Celtic despatch Newbridge United. 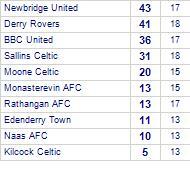 Newbridge United has yet to win in this competition, having lost all 2 games. Arlington AFC claim victory against Newbridge United. Newbridge United are defeated by BBC United.